Reviewed by Kassandra Ni. Viewed at the 2019 Santa Barbara Film Festival. First Reformed (2017) is a intense film that manages to cover religion, politics, and our slowly declining environment within only 113 minutes. This movie is eloquently written by the genius, Paul Schrader who has quite a career in the filmmaking industry. Schrader’s works include: Taxi Driver (1976), American Gigolo (1980), and Raging Bull (1980)–just to name a few. This movie does more than just guilt-trip the audience into becoming more aware of their everyday actions on the environment, but it also highlights the important relationship that big businesses have on our political system and how non-secular enterprises are just as involved in politics than they let on. A vision for a film isn’t always enough to carry out a theme or relay the film’s purpose to an audience. The casting and overall performances from the actors are also greatly significant for providing cinematic influence to audience members; as well as fulfilling the vision of the screenwriter and director, in this case Schrader’s vision for First Reformed (2017). I’ll be the first to say that the casting of Ethan Hawke as the troubled Reverend Toller in the film is quite an unusual role for the actor. I’ve come to know Hawke for his more bohemian and “off the wall” characters, rather than his portrayal of more serious/conservative characters. That being said, following a screening of the movie, the audience was fortunate enough to get to speak to Director Schrader about his movie and to ask him about his choice of casting for the main character. Schrader’s decision to cast Ethan Hawke was based on Schrader’s observation of the distinct contrast of Ethan Hawke in real life and how Schrader wrote Reverend Toller in the screenplay. This contrast of a fun-loving Texan to a deeply depressed and lonely pastor is what makes the choice of casting Ethan Hawke work. With additional support from talented actors, Amanda Seyfried and Philip Ettinger, the plot of the film carries on and the audience becomes captivated in Reverend Toller’s one year journey. 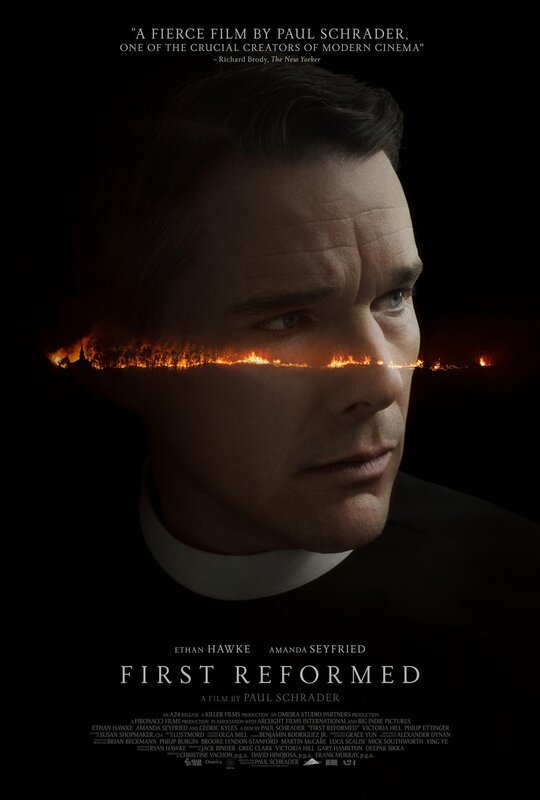 Being set in present day time, First Reformed (2017) follows an alcoholic pastor who struggles to find closure in his son’s death, a death that he feels partially guilty for as he urged his son to fight in the war. Having to continue living following his son’s death and the ultimate failure of his marriage, Toller finds a job as a pastor on the grounds of the First Reformed Church in upstate New York. Living a life without purpose, he begins to write in a journal that he will keep for one year. Within that journal he writes about his daily ventures/ observations and also some details about his mentoring sessions with a young couple belonging to the First Reformed church. This film is a thought-provoking journey into the complex relationship of religion, politics, and environmental advocacy in our present day and age. Paul Schrader is nominated this year for an Academy Award for Best Screenplay for his film First Reformed (2017). I liked the analysis of the characters and the history of the director and his accomplishments. I think this review is very comprehensive and well done. This is an incredibly well written review. I agree the film was very layered, and I enjoyed your analysis and how you unpacked those layers here!